The bash shell is powerful software for Linux, Unix, and other systems. It comes as a standard part of most Linux distributions ("distros") and most Unix systems. You can even get versions that will run on MS-Windows systems (see cygwin). It is the "command line interpreter" that you get when you bring up a terminal window like Terminal or Konsole. 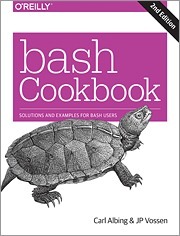 Here is a pile of helpful reference documents (not for beginners) dealing with bash. Great Bash video, from O'Reilly, will teach you the fundamentals of bash shell programming. Beginning with simple shell scripts and progressing to complex, automated system administration and file management tasks, you'll get a firm handle on control structures and the decision-making abilities of the bash environment. By the time you're done, you'll have written more than twenty complex shell scripts. 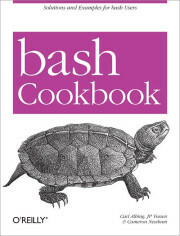 Join Carl Albing, co-author of the bash cookbook, for screencast lessons of some great bash! Buy it today; use it every day. if you think you found an error in the book, report the error to O'Reilly. Here are some excerpts from, or references to, book reviews of the bash Cookbook (1st edition). We're sure it only gets better with the 2nd edition!